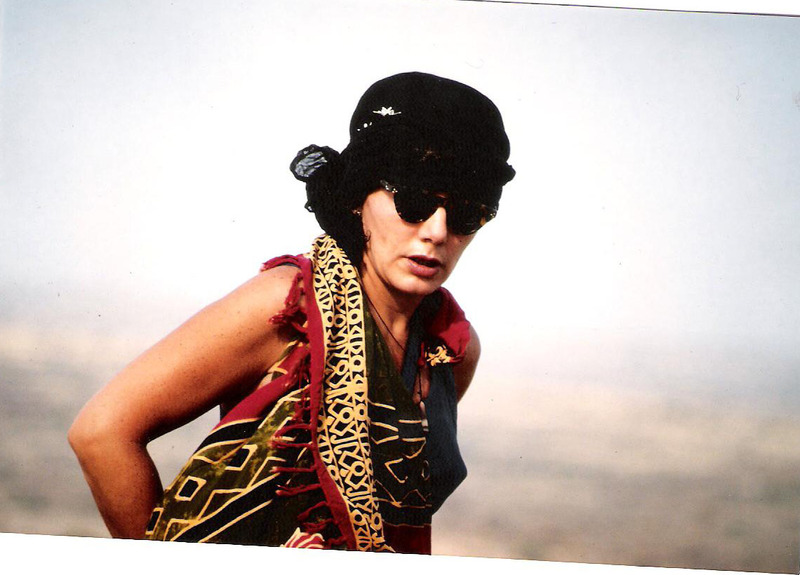 One thinks of AFRICA and sees immediately deserts or wild animals, sun and heat…. What else ? I do not know what else exactly because by now, AFRICA is my home. ... one of these are RIVERS and green mountains, long rivers, important rivers, harsh mountains. 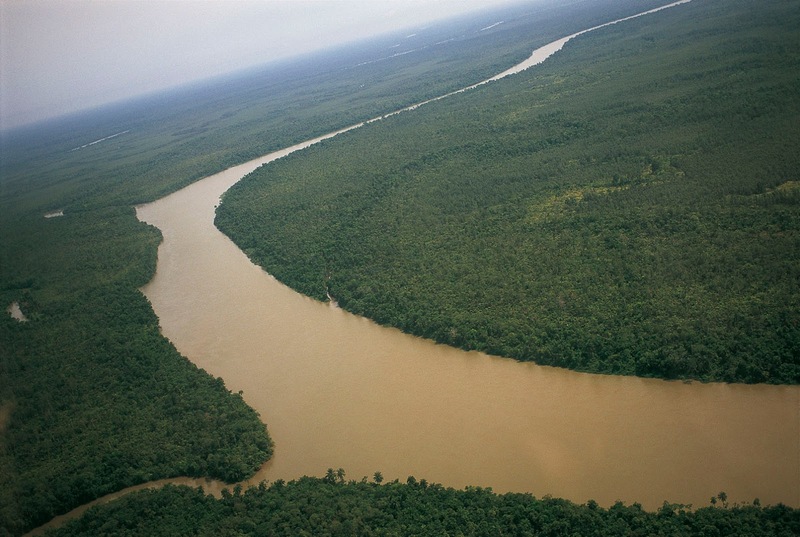 Life in AFRICA is mostly along RIVERS. Everything occurs along those pathways that cover not that much of the Country, but still brings water to many places. I remember seeing dark green shores with brown water, sometimes lighter sometimes darker. Logs floating. Wonderful wood floating all tight up, leaning on big empty drums not to soak the timber. 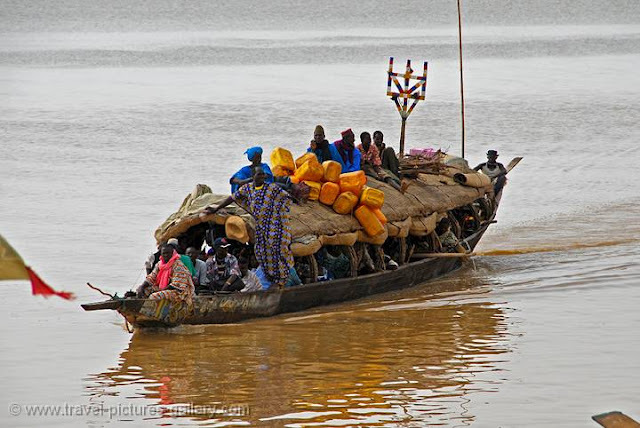 Along that part of Niger River reaching Port Harcourt you can find anything floating. This has been for many and many years the easiest way for locals to bring goods to the harbor and sell it and then be shipped away. It is a very long river going in land and making a big turn back touching five States of West Africa. Up North, in Nigeria, the Fulani people, soak their wonderful clothes full of bright colors in the water and then find a nice wide open space to lean them over small bushes to dry in the sun and not to get dirty again with the strong, red, thick earth. 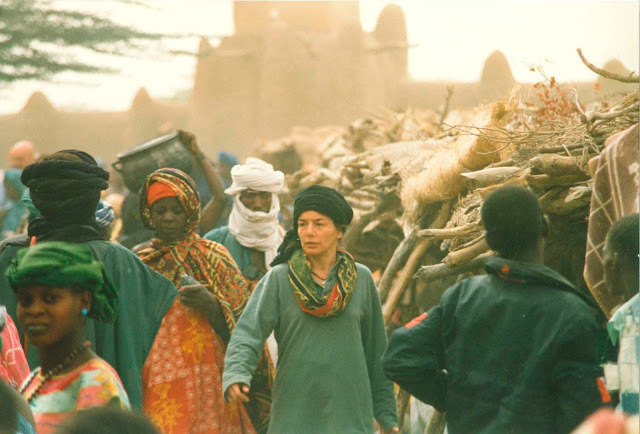 I was in Mali, not long ago, again, and I spend days at the market in Mopti. I would sit on those great and wonderful, most of the time tiny, benches/seats/three legged stand and drink some hot mint tea and spend some words with people that stand and sit and talk and wait that somebody would buy something. Where ever roads meet a river in Africa, you'll find a market. They can be small, just made up, they can be bigger and half organize. People wait. Sooner or later someone will cross the way and will need anything you sell. 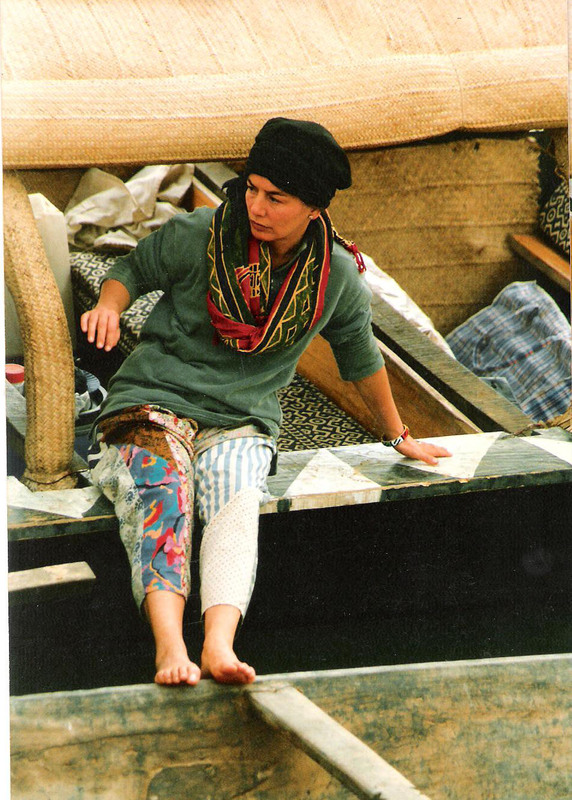 One day I stepped on a pinasse (the Niger River boats) and I let time take space. Long bunches of strew tighten up perfectly together made my days so comfortable that each day along the river I felt I was cuddled up by the pinasse that was becoming my home. The shores along Niger River in Mali are most of the time flat and sandy. You may encounter more pinasse dragging anything, sometimes so full that you cannot imagine how in the world can they possibly float.... and yet, they do ! The pinasse stops for the night and you may sleep on it or pitch up a tent on the ground. The sand gets cold but the sky gets full of stars and it feels warm. Dark, very dark but full of stars. The colors of the pinasse and the river and the sand and shores and the air are not much different. All the shades of beige-brownish-light. Dusted. 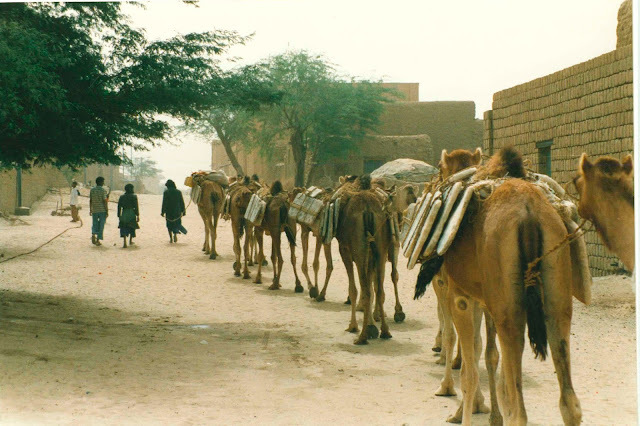 You see camels and you know you are near Timbuktu. 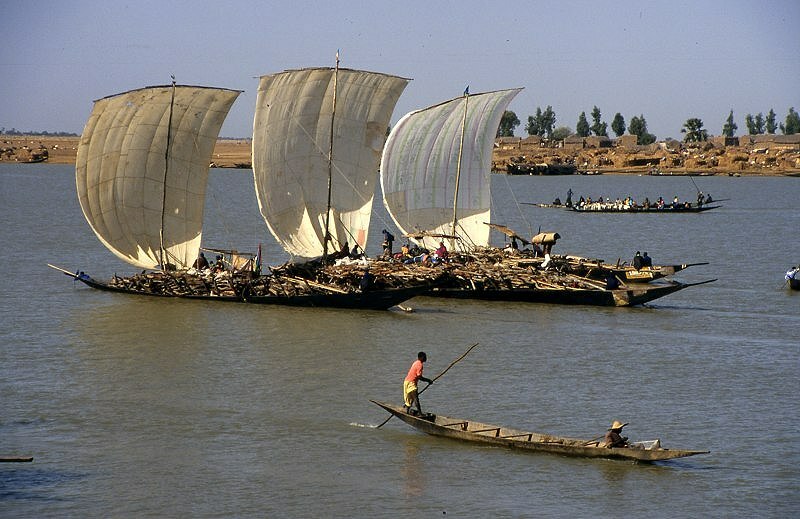 Where once salt slate was carried against camel's back now often are loaded on pinasse which will float on Niger River, too.